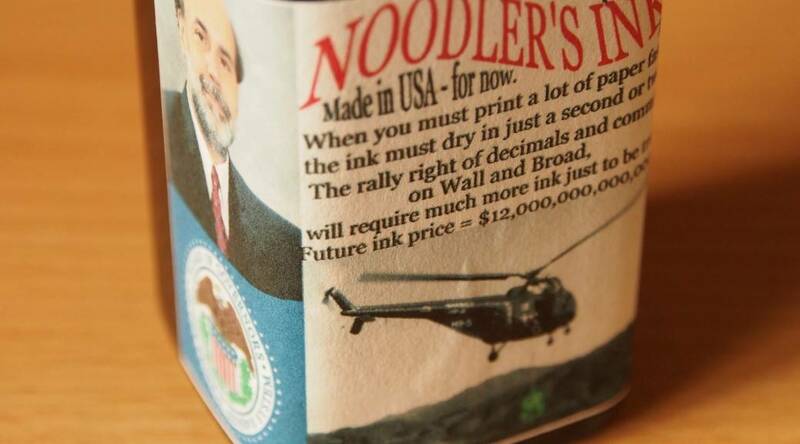 Both the name and the label are a critique of US financial policy and the Chairman of of US Federal Reserve Ben Bernanke. The thrust is that if you need to print lots of money fast (whether that’s a good or bad thing I’ll leave to others better qualified than me) then you need a fast drying ink. 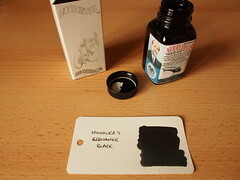 This ink came from a UK supplier and cost £10.00 for the usual 3oz bottle – this puts in in the “low cost” category for me. 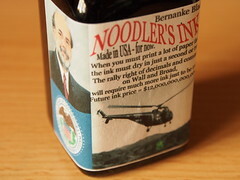 The label carries on the financial critique, showing Ben Bernanke, the seal of the Federal Reserve and money being helicoptered in. 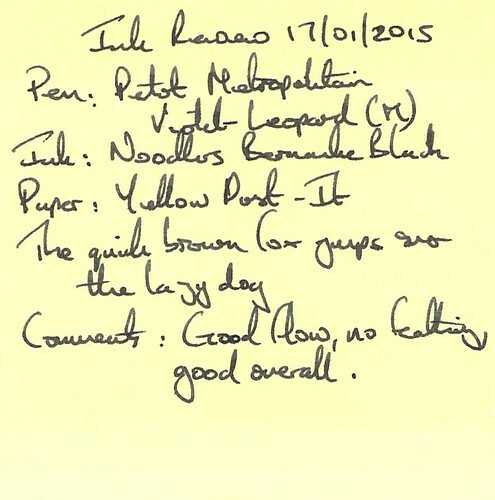 The test pen on this occasion was a Pilot Metropolitan Violet Leopard with a medium nib. 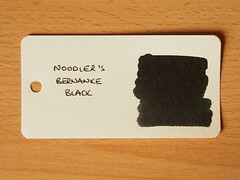 The ink showed some water resistance (black lines were still present after running a sample under water) but water drops obliterated any text. Cleaning was easy. This ink is intended as a fast drying ink – so how fast did it dry? I wasn’t able to repeat the near-instantaneous drying on high quality paper shown in the video. 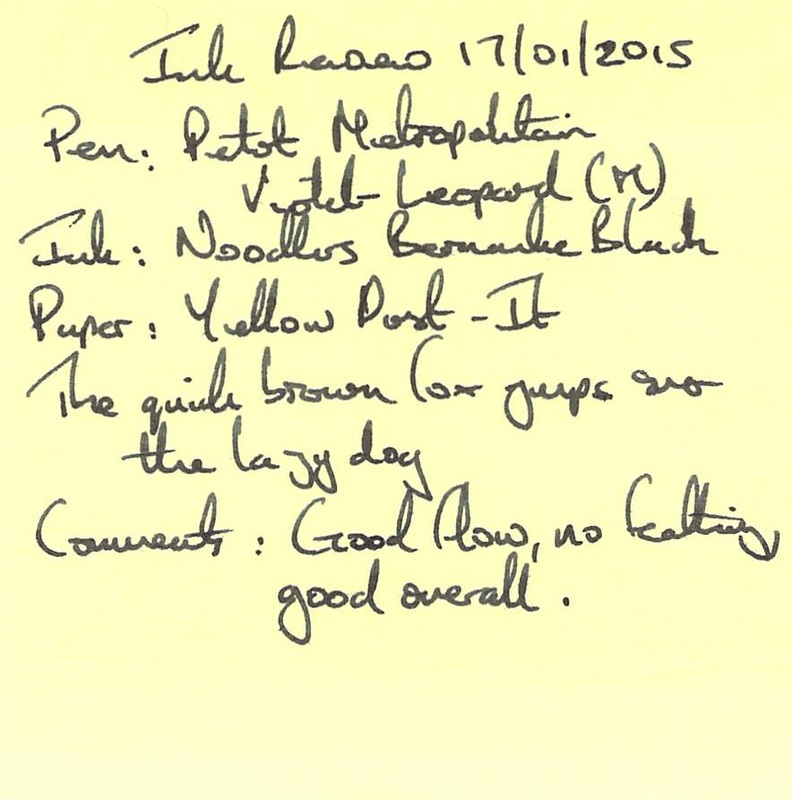 In practice I found the ink to be touch dry after about 30 seconds on Rhodia. I ran this test several times. The more of these reviews I do the more I’m becoming conscious of the fact that my drying times seem to be a lot longer than many other reviews but I can only recount my experiences. 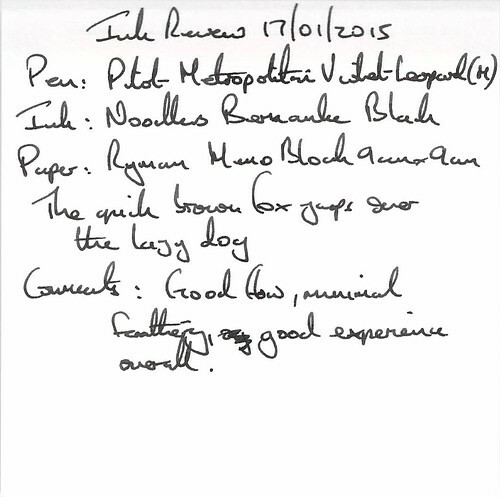 I would still class 30 seconds as fairly fast, certainly compared to many other inks I have reviewed. 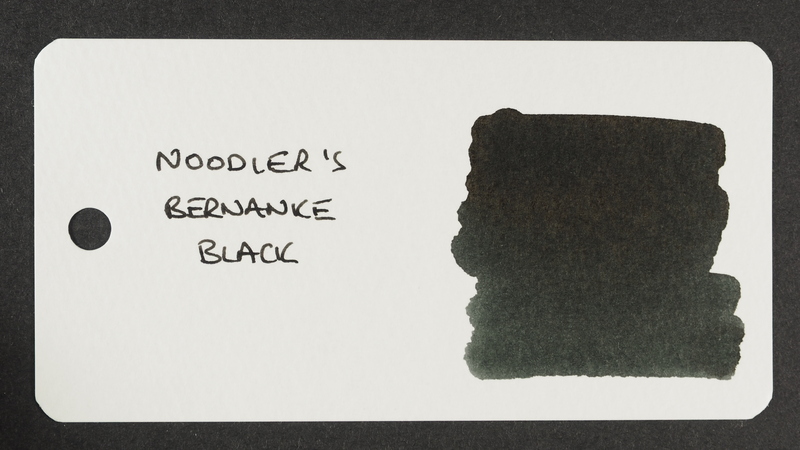 The ink to be a good performer on Rhodia Paper, drying to a deep black i.e. the kind I like. 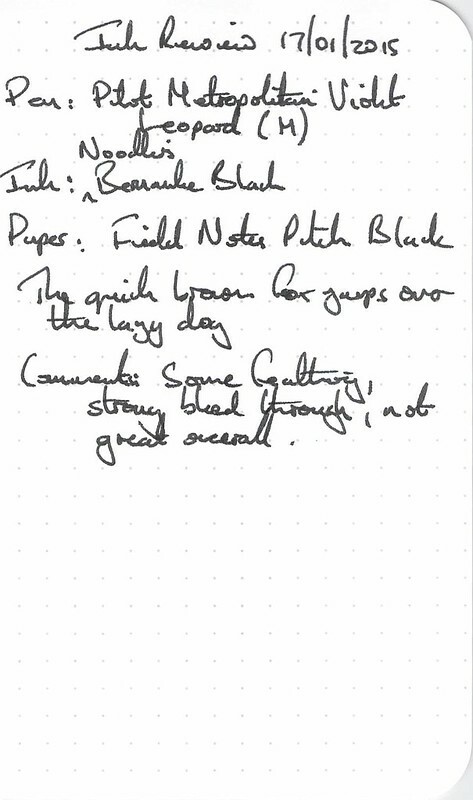 The results are very close to Rhodia, although I note that the black is slightly lighter – still fine though. The experience was good overall but looking again at the writing sample I do note some feathering. Feathering and bleed are the problems here, and they are significant. 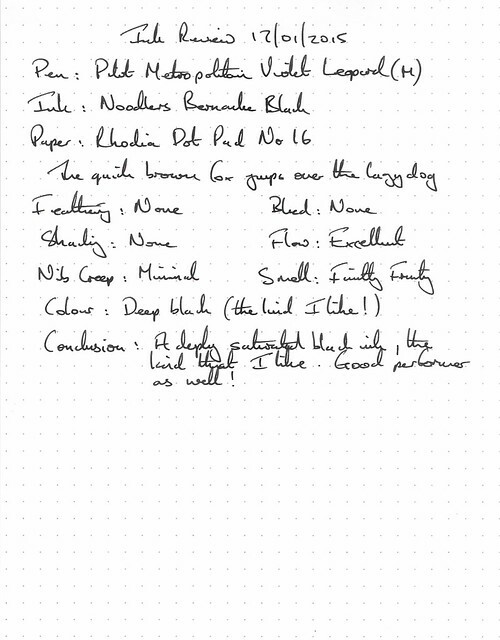 There is a hint of shading here which didn’t really come out in the writing samples. Better water resistance would have been useful, and I didn’t find the quick drying properties overwhelming, but overall I would consider this to be another good performing black ink from Noodler’s. I will be trying it again and it will be interesting to see how it performs on a range of papers with different pens.